For the tree to grow, its foliage must receive as much light as possible. A walnut, for instance, needs so much sunlight that it uses chemical weapons against its competitors. Its roots, bark and leaves produce juglone, a molecule that accumulates in the soil around the tree, prevents other plants from germinating and can even kill some of them! 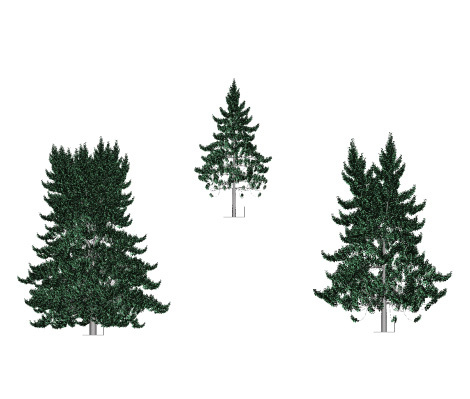 Some scientists say that the quest for light explains the conical shape of conifers in northern regions. The sun's rays strike trees' foliage from the side, instead of from the top, at those latitudes. In the same way, we northerners tilt our solar panels toward the sun. When the tree builds its scaffolding out of its trunk and branches, it has to be versatile enough to take advantage of all the light available to it. But the more it leans, the more resources it has to devote to strengthening its trunk, and the greater the risk of it being damaged or even uprooted. The solution is an ideal balance between form and function. This means that the branches of two trees, even members of the same species, can be shaped quite differently, depending on the light conditions.